Time is flying by and I'm back with another selection of short reviews for products available through Love Lula. I chose this exfoliator for my holiday because after a day at the pool nothing feels better than scrubbing off the layers of sun cream. My skin is delicate so I need to be cautious, it was a gamble picking Acure but seem to have paid off. The scrub is a wonderful dark forest green colour which I find a little messy but I’m someone who exfoliates in the shower so it easily washes away. Walnut shell has been crushed into a fine grain which feels good on my skin. The aroma is interesting. At first I thought it was ginger but once I looked closer at the ingredients I realised I was mistaken and it's spearmint and sage. I still have to take my time with this scrub because it can feel a little scratchy but I enjoy using it. Note of caution for those with fragrance allergies: I've noticed a lack of essential oil allergens listed on Acure products. In October I ordered the Night Cream and alarm bells went off because it smells strongly of lavender, which I know contains the allergen linalool. The US doesn't have the same labelling regulations as the EU but as Acure sells products here they would be expected to comply. Under the EU Cosmetic directive there are 26 fragrance allergens which should be identified on products if the concentration exceeds 0.001% in leave-on products and 0.01% in rinse-off products. Only Acure knows whether this is applicable to their range and I raised the question with them. They failed to give me a straight answer and simply told me "Please refrain from using any product that you feel may cause a reaction"
If you’ve followed my blog for years then you know my foundation of choice and I rarely try anything new. Disaster struck when it went out of stock weeks ago and I didn’t have the patience to wait an order from USA. I’ve tried a couple of Ere Perez products and liked them so the foundation seemed a good choice. The downside is there are only three colour options so I was really sitting on the fence whether Light would be the right one for me. I was pleasantly surprised that it doesn’t make me a ghost or tangerine. It layers on lightly so perhaps doesn't cover all imperfections and I have a fair amount to redness that I like to hide. As with my regular foundation if I want to improve coverage I’ll layer over my Madara Tiniting Fluid. It’s a super fine milled powder with a lovely silky texture so it’s the closest I’ve found to my favourite brand. It also gives a nice sheen to my skin, not glitter ball shimmer but a little sparkle of sorts to make you look airbrushed. 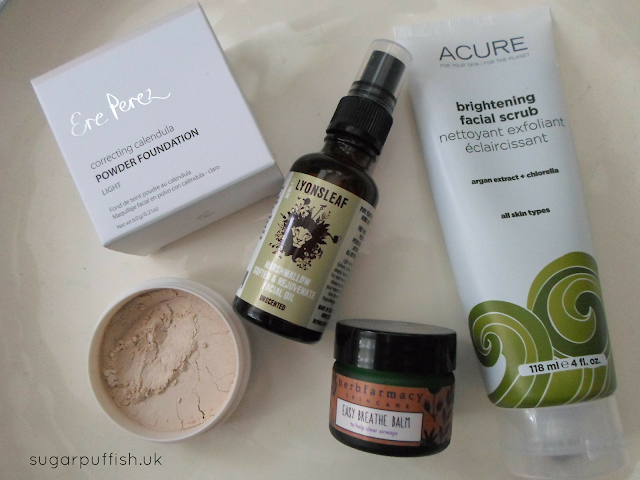 I am impressed as most other brands I’ve tried are patchy and heavy on my skin. The downside for me is Ere Perez costs £27 for 6g which makes it more expensive than my usual brand. Herbfarmacy is a great brand and when I ordered this Easy Breathe Balm I was suffering with a horrible cold. I must admit I was slightly disappointed because I wanted this product to pack a punch in scent but found it weak. After my cold passed it smelt a little stronger but still didn’t quite hit the spot. I’m very excited to see one of my favourite brands launch unscented facial oil. As you may know essential oils are hit and miss for my skin so fragrance free eliminates this worry. This facial oil contains a lovely blend of ingredients (baobab, borage, rosehip marshmallow, avocado) so it’s no surprised that I am loving it. It feels rich and luxurious on my dry skin but used sparingly I’m sure other skin types would enjoy. I highly recommend but I’m bias as I’ve been using Lyonsleaf products for a few years. If you prefer there is a scented facial oil.